The ERASMUS flight crew (from left to right: Gijs de Boer, Phillip D’Amore, Al Bendure, Tevis Nichols, and Doug Weibel). After four flights on Saturday, Pilatus had a tailwheel issue that kept us grounded for the rest of that evening. However, on Sunday morning the airplane was again ready to go, and so were we. With (relatively) light winds around 15 mph, I was excited to continue to collect good measurements — the sun was even out! After a bit of troubleshooting for our instrument payload, we were able to launch the first flight Sunday around 10 am. 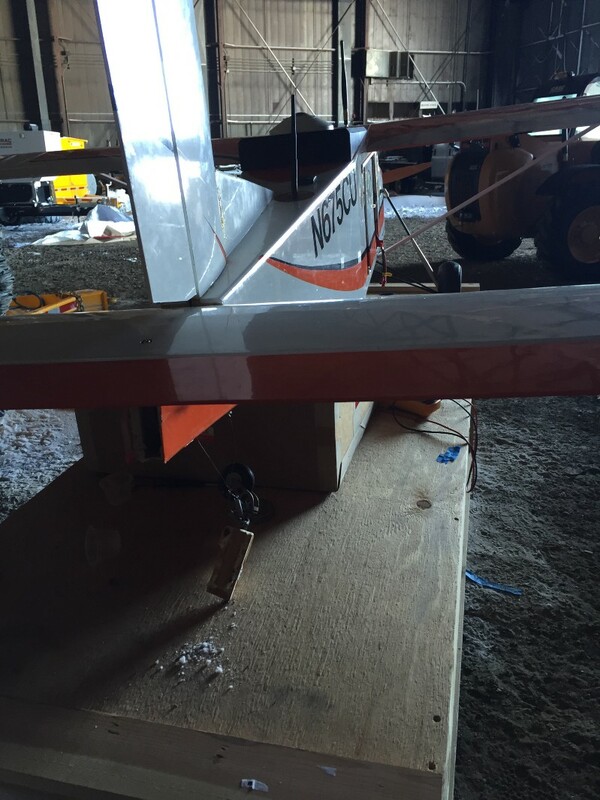 Unfortunately, we again had a separation of the tailwheel support structure on landing — glues and epoxies just don’t work as well in the cold as they might in warmer climates. This resulted in another 2-hour delay before launching for our sixth flight of the campaign shortly after lunch. For this flight we changed the payload to carry two broadband longwave radiometers (along with our aerosol sampler, POPS, and our thermodynamic probe). For the first seven minutes of the flight, everything went very well, and the aircraft was flawlessly executing its box pattern. Then, things got a bit hairy — “We are losing altitude” and “I have no propulsion” are not words that you want to hear when operating an unmanned aircraft, particularly when the aircraft is on the furthest waypoint of the flight pattern… For some yet unexplained reason, the Pilatus propulsion system experienced a failure. Now any aircraft can experience propulsion system failures (even large passenger jets), and the flight crew (Doug and Tevis) handled it in a controlled, professional manner, gliding the aircraft down from its 100 meter cruise altitude for a safe landing. After getting a GPS fix on the approximate landing location, I went for a ride in the Kubota with Wessley King, one of the AMF-3 operators and our bear guard for the day, to recover the plane. 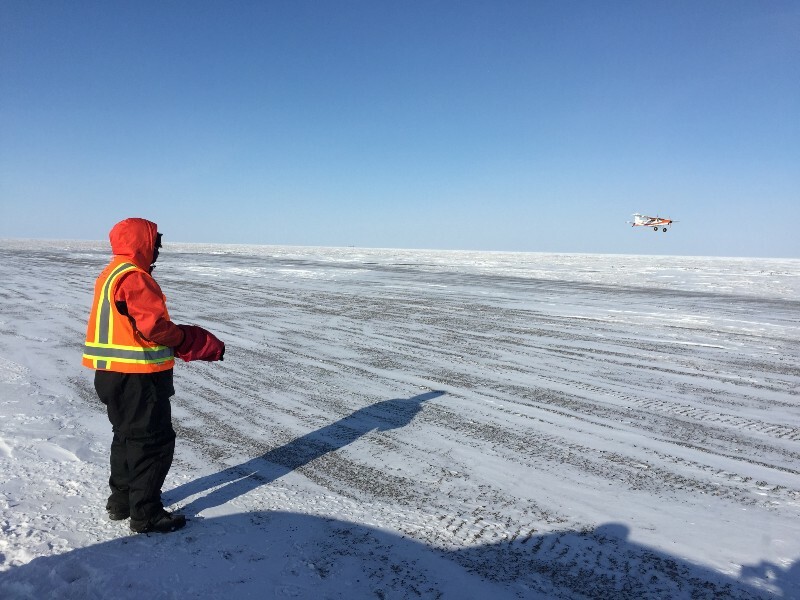 After heading down to the beach, we were able to make visual contact with the aircraft, sitting beautifully approximately 100 yards offshore on the sea ice. It was really hard to tell that anything had gone wrong! The only damage was again to the same tailwheel block that had already failed twice and to one of the main gear struts which had popped out of its wheel hub due to a harder-than-usual landing. The airframe itself, along with all instruments were just fine, and our data system was still collecting measurements until I got to the plane and powered it down. Doug guiding the Pilatus down for a soft landing. 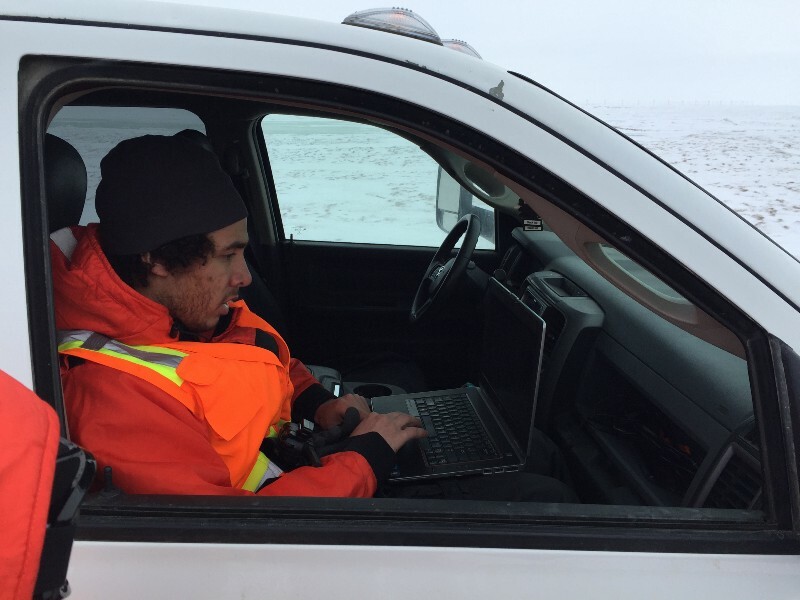 Tevis mans the ground station during flight. We took the plane back to the hangar for testing and could not find any obvious issues — the motor, power system, battery voltage and speed controller all seemed fine, and power and thrust testing also went well. There had also not been any indication of autopilot or radio communications failures, as both continued to work until the aircraft was powered down. This left us scratching our heads as to why the plane lost propulsion. We likely won’t have an answer to this question until we’ve had a chance to do more exhaustive system testing and analysis of the logged files back in Colorado — it is possible (but speculative at this point) that the extreme changes in temperature between the ambient “cold” conditions (around 5 F) and the warm temperatures experienced in flight impacted the performance of the electric motor. 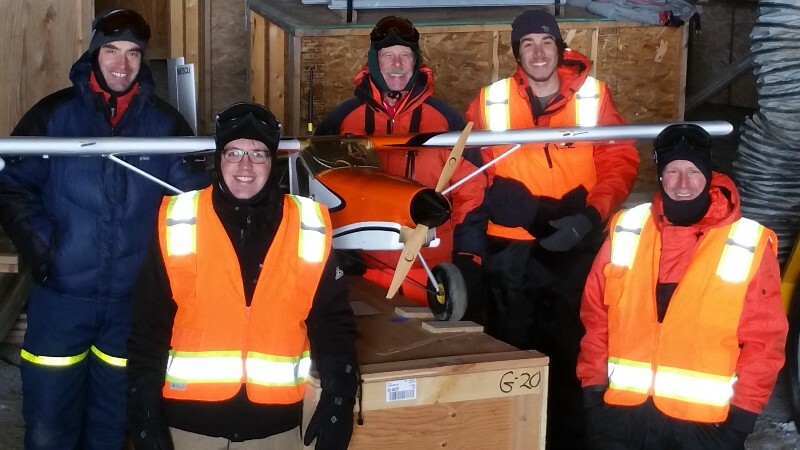 This event was certainly another reminder that what we are trying to accomplish is not at all easy, and that operating unmanned aircraft in the Arctic is something that pushes the limits of our current equipment. It also demonstrated that when the appropriate safety procedures are followed and risk mitigation is undertaken, system failure such as this does not have to have a bad outcome. Manned aircraft could have similar system failures and it is for this reason that pilots generally feel uncomfortable flying at 100 m altitude over the sea ice and why this is a great application for unmanned platforms. While the aircraft was easily repairable to a flyable state, given the uncertainty surrounding the cause of the propulsion failure, we made the decision to stop flying for the campaign and began packing up to head home. The Pilatus after its sea ice landing. The tail wheel damage was roughly the extent of the repairs. After an evening and morning of packing up equipment, we loaded our crates onto the truck and set out on the road back to Deadhorse. Beyond a few caribou sightings, the drive was uneventful, and we made it to the Deadhorse airport in a little over an hour and a half. After dropping of our shipments and our rental truck, we boarded our Alaska Airlines flight to Anchorage. In the end, I would say that this campaign was marginally successful. I say marginally, because although we got some good flight time in, any time a planned two-week campaign gets compressed into two days, you are likely to leave thinking about what could have been. In this case, we got in as many flights as possible, including several DataHawk flights in very, very tough and unfavorable conditions. In the end I remain convinced that we have a lot to learn about the Arctic environment, and that these systems can help to provide new, unique perspectives. With every campaign we learn something new about both the natural world we are studying as well as the aircraft systems, their limitations, or what we need to improve in terms of system performance. It makes me incredibly thankful for the fact that at CU we have world-class expertise in both high-latitude physical sciences and aerospace engineering, and that we have university leadership who see the value in bringing these groups together to conduct exciting, ground-breaking research. I’m also thankful for the support (both financial and operational) provided by the Department of Energy for our work, and the time put in by teams at NOAA ESRL and NCAR on developing payload components for the Pilatus. Over the next few weeks, our CIRES and Aerospace teams have a lot of work to do to prepare final datasets and reports, evaluate the aircraft, go over what we learned, and decide how we’ll do things differently next time. 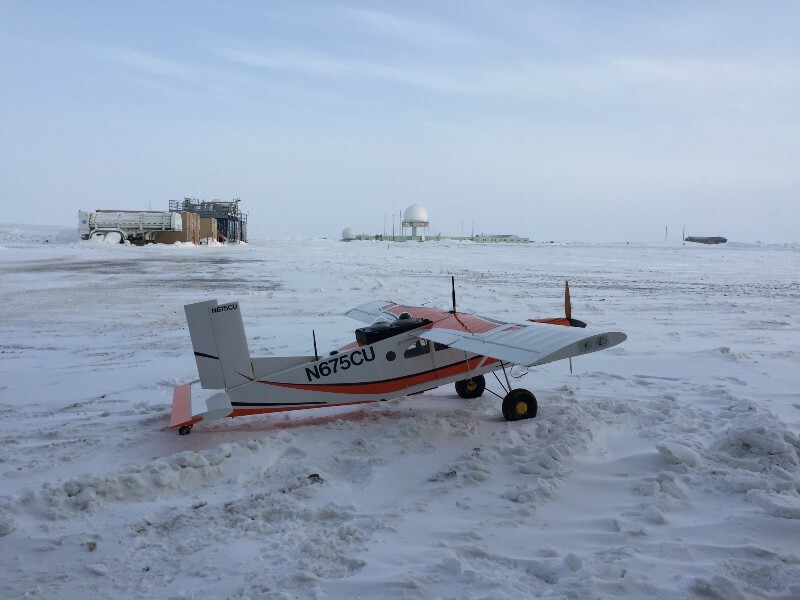 I look forward to again facing the challenge of operating small, relatively low-cost unmanned aircraft in the Arctic head on in the near future. While not for the faint-of-heart, it definitely remains a lot of fun to conduct the important work of advancing our measurement capabilities using these platforms! The Pilatus posing out in front of the AMF and USAF radar facility.